I'm a bit of a texture freak when it comes to fabrics, whether making my own, buying textured fabrics, or simply admiring the work of others. 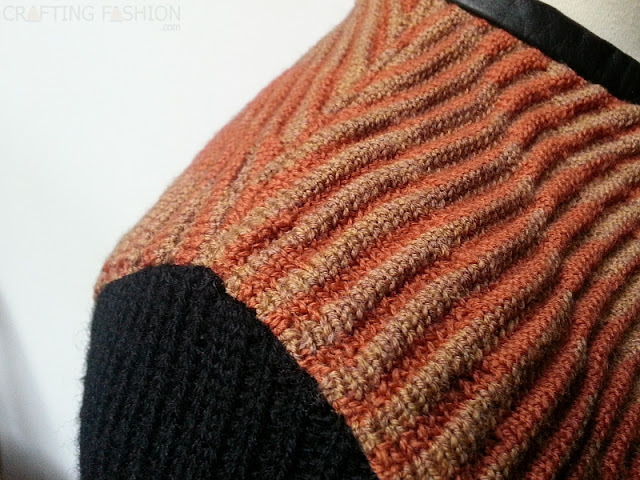 There are so many ways to introduce texture into the fabric when designing knits; that's why I love designing them so much. And I love when texture and garment work well together. A few weeks ago, when my Saratoga Rib was still in pre-production, I asked Debbie Iles of Lily Sage and Co, if she'd like to work with some of the fabric when it was ready. "Yes," she said. The photos (above and directly below) are of the amazing Megan Longline Cardigan that Debbie sewed with the Saratoga Rib. You can read about her experience with the fabric here. Whenever I get to do an original fabric design, my thoughts are always how can I get MORE texture into this. That was the case when I added just another tuck loop to my new design building texture. I always enjoy seeing how others bring texture into their sewing and fabric projects. About a week ago after a failed attempt to attend a design and technology exhibit at Parsons School of Design, (The building was closed on the last day of the show?!) my husband and I were walking back down Fifth Ave and saw the announcement for Parsons School of Fashion Graduate Exhibition. Guess how we spent the next hour and a half? My favorite pieces had all the texture, of course. 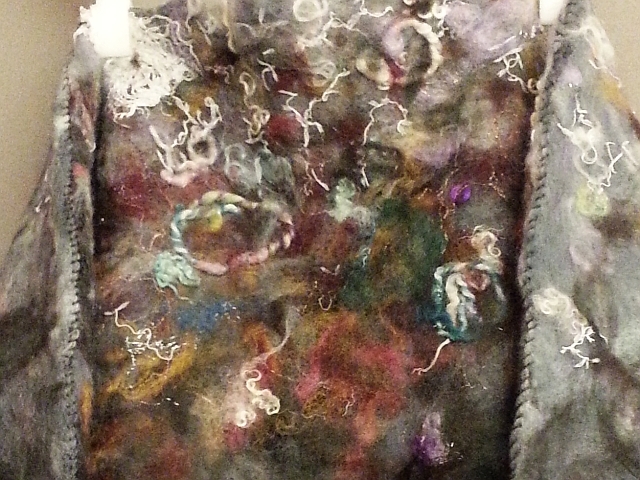 Freeform embroidery and dye work in combination with the texture of felt to give amazing depth in this detail view of a top by Hae Yeon Shin. 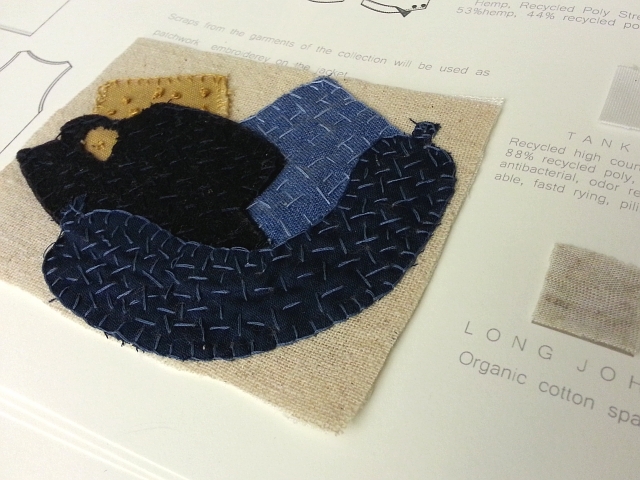 Below is more embroidery with patchwork, this time from Olivia Burca. 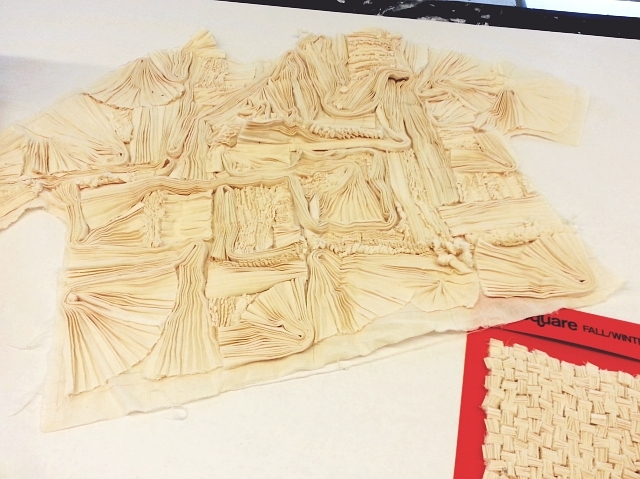 Lots and lots of folds are worked into muslin by Mengtian Sui. I would have loved to have seen this one as a completed garment. I wonder how heavy it would be. Anyone else drawn to textured fabrics? What special approaches do you use when sewing them? Join the email list for updates on what's new in O! Jolly! sweater knit fabric shop, special sales, and O! Jolly! news. Love texture, too! Saratoga Rib is fabulous!